We bought an iPad. I've quite fancied one since they came out, but the real Apple fanboy in the family - almost-8-year-old Harry - has been desperate for one. So we finally bought one and Harry described it as a "dream come true." 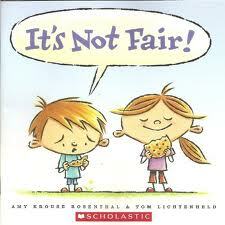 We've downloaded quite a few picture book apps, which I'll write about another time, but the first actual picture book we downloaded was Amy Krouse Rosenthal's I'm Not Fair. I love Rosenthal's books - particularly Yes Day, which is also illustrated (beautifully) by Tom Lichtenheld (who, I just realised, also wrote and illustrated the wonderful E-mergency!) - and It's Not Fair is another treat, written in rhyme (which doesn't always work without an American accent! ), children and more complain about how life isn't fair. You know, like children do ALL THE TIME. One thing I will say is that after spending the day playing with book apps, a plain old book seemed a bit, you know, limited. This is, I know, ridiculous, since I've been reading books for 40 years and, at the time of reading It's Not Fair, had had the iPad for about four hours, and yet I found myself tapping the picture and expecting it to do something. Sigh. You can, however, zoom in, which was great for looking at the chicken pox up close and is also good for isolating particular words or parts of pictures. 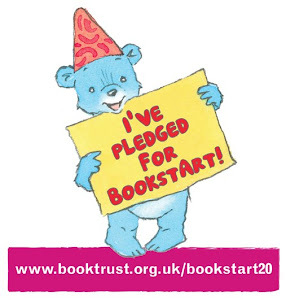 I read Squish Rabbit via We Give Books, a fantastic site created by the Penguin Group and the Pearson Foundation that donates to selected charities for each book read online. I was attracted by the cute, uncluttered cover and the book is equally cute and uncluttered. It's the story of a little rabbit named Squish because he's so little he keeps getting, well, squished. He's also so little that people don't notice him, so he's lonely too. Eventually, of course, Squish finds a friend and the illustrations of them meeting each other are really adorable. In fact, every page is adorable. I love it when illustrators manage to convey emotion in such simple characters. I also love that Squish makes himself a friend and also, at one point, has a tantrum - I'm sure many children will identify. It would be a great book for a child who is struggling to make friends - perhaps one who has just started at nursery or preschool. 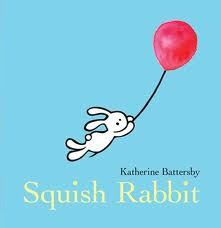 Squish Rabbit is a really sweet book that I'm pleased to have discovered. I'll definitely check out the 'real' version one day too. I suspect the illustrations are even more lovely in 'real life'.